Superb collection from Japanese Rock A Shacka new for the summer 2018. 20 tracks all from Prince Buster's group of record labels in Jamaica, issued mid to late 60's. 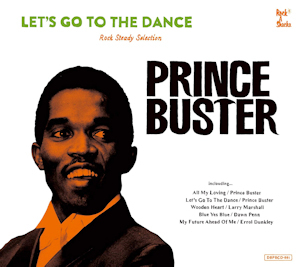 Seven tracks by Prince Buster and the rest by various artists. We are treated to a single sheet of paper (less than A4) which gives full details of every track by Chris Lane, in both English and Japanese! The pick of the bunch is Fredddie McKay with Red Eye Gal / Giving You A Try Girl. This record can only be found on a white blank Olive Blossom JA pressing. It has been listed as issued on Blue Beat UK BB 386. But a copy has never been seen. Yet this same catalologe number can be found on Blue Beat 386 Jesse James Rides Again / Red Eye Girl The Bees. It is no wonder that JA blanks sell for many hundreds of pounds. The CD booklet has a track listing and printed lyrics to all the vocal tracks. Highly Recommended. Issued on Drum & Base - Rock A Shacka DBPBCD-001 Japan.